Can anyone guess what year this football game was from? Well, my Puddlers, tomorrow is the Thanksgiving holiday that we all love so much. So, in honor of the holiday, please spend your morning nursing a hangover from Thanksgiving Eve and reading Puddles of Myself. Then, in the afternoon you can eat all your favorite Thanksgiving foods, watch football, sip on scotch and coffee, eat pie and then fall asleep. In order to ease you into your long weekend, here are some fun videos from one Stephanie Terao's birthday party, which took place on November 18, 2010 right after the Puddles of Myself Fiction Reading. These videos capture an epic game of "Big Joe" that was played. "Big Joe" is just a stupid alter ego for life-sized Jenga. To all those were there, enjoy. To those who weren't, you have to jump on the Puddles of Myself bandwagon. 1993 Thanksgiving. 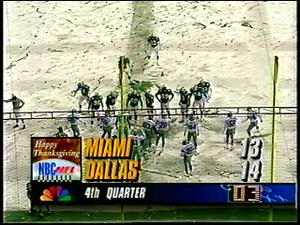 Leon Lett's blunder. No one's going to comment here.